This is a revised edition of a post that originally appeared on http://www.teleosis.org on June 29, 2015. The choices we make and the stories we tell emerge from how we see our lives, and have a powerful impact on what we’ll be able to see and do next. We learn our earliest storytelling predispositions from the narratives our parents, guardians and teachers tell when we’re very young. Having just fallen from the tree and broken our 8-year-old arm, are we confronted with an inquisitorial scolding about carelessness, danger and fear, or are we enveloped in a loving embrace that connects with our pain, creates awareness around the risks of exploring while still accepting the inherent value therein, and expresses gratitude that we are, in fact, all right – albeit with a broken arm. These earliest narratives set a thematic undertone that we may not be aware of for years, if ever. What is your thematic undertone? Conventional approaches to engaging illness, injury and other loss tend to focus on what is wrong and set out to fix or control it. The illness/injury/loss narrative tells the story of this wrongness, fixing and control. The healing narrative tells the story of who and how we are, what and how we see, and what we do and how we do it when faced with life’s inevitable challenges. Which have you chosen? Which will you choose? In And Now Still the healing narrative emerges amid love and loss, clarity and confusion, grief and healing. Each poem, rather than a final word, is part of an ongoing exploration into healing, and plays an essential role in how the poet (i.e. how I) move forward. To the extent that, as a poet and human being, I am aware of and intimate with the narrative of my healing journey, I am better able to live each moment intentionally, as the author of, and not just a character in, my story. Do I ever have complete control? No, and I can make conscious choices about how I respond to that which I cannot control. Healing narratives are ongoing stories that unfold in unique, nonlinear, spiraling, challenging, insightful and increasingly balanced and inclusive trajectories. They invite us to ask, “What’s really happening right now – what’s true in this moment?” and then provide us the space to interpret this “truth” and tell our story in a way that supports and nurtures our healing. This invitation includes an irrevocable license to revise our telling – to adjust our story – as our awareness expands, as we are more fully present to and accept “what is,” and as we connect more deeply with family and friends – indeed with our common humanity, and much else beyond our often limited sense of self. What stories do you currently tell, and how do you tell them? Do they serve your healing and growth, or do they keep you stuck? A little bit of both, perhaps? 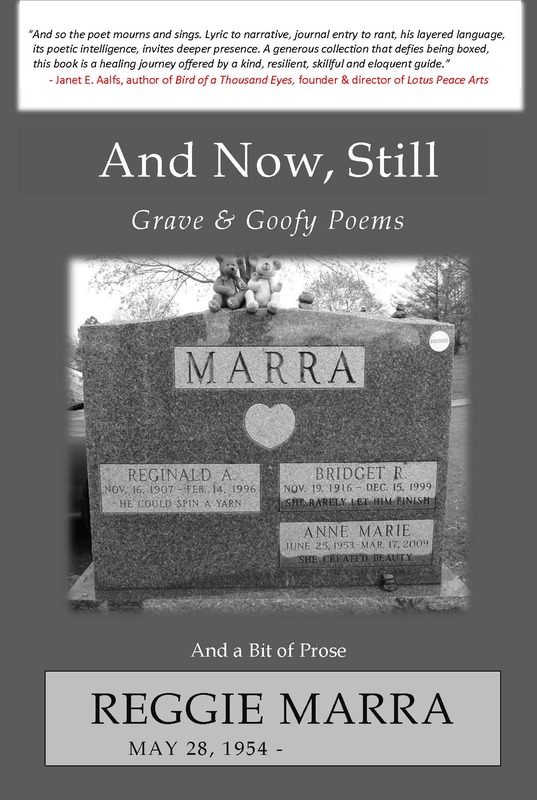 This entry was posted in healing, narrative healing, poetry and tagged grief, narrative healing, poetry by Reggie Marra. Bookmark the permalink.